Download "The Professional Educator Portfolio (PEP) and the"
1 Electronic Professional Educator Portfolio (E-PEP) 1 The Professional Educator Portfolio (PEP) and the Electronic Professional Educator Portfolio (E-PEP) 1 Portfolios have become increasingly valued in the field of education. There are three basic types of portfolios: a documentation portfolio shows growth toward a particular standard, a process portfolio documents phases of learning, and a demonstration (showcase) portfolio 2 shows a student s accomplishments and mastery of standards. The Professional Educator Portfolio has been in development by WestConn s Department of Education and Educational Psychology for twelve years 3. The PEP reflects the knowledge, skills, and dispositions that define excellent teachers. The PEP is created in hard copy or as an e-portfolio (E-PEP) and is updated regularly to focus on the purpose of the portfolio and the intended audience. A quality portfolio contains exemplar artifacts which are posted for each component. 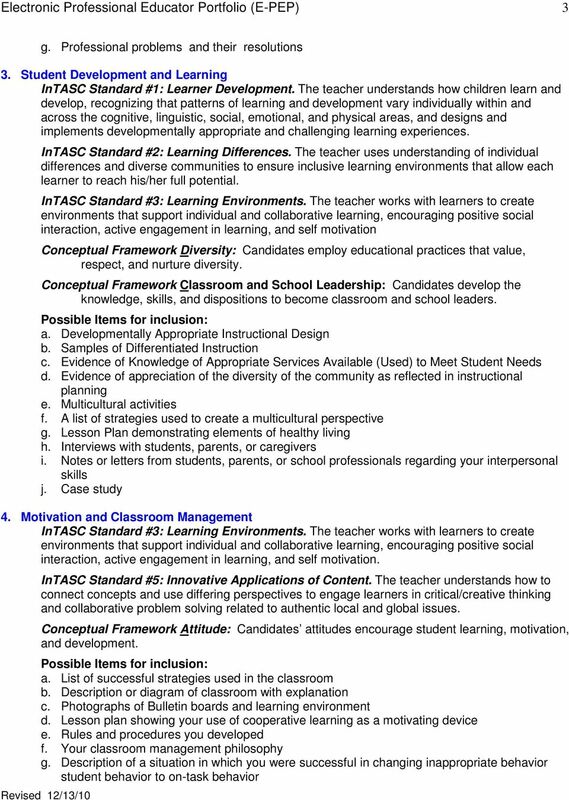 Each exemplar is accompanied by a meaningful introduction, rationale for inclusion, and reflections that communicate the student s growth and development as a teacher. 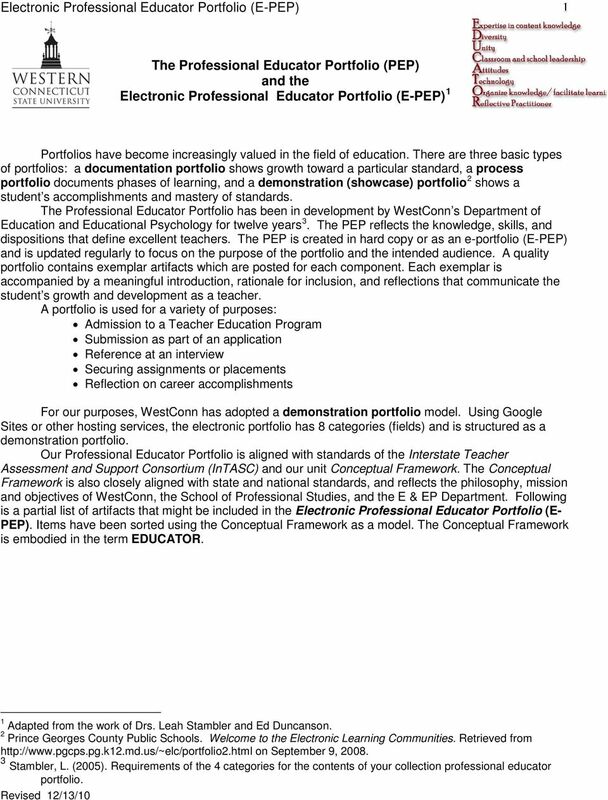 A portfolio is used for a variety of purposes: Admission to a Teacher Education Program Submission as part of an application Reference at an interview Securing assignments or placements Reflection on career accomplishments For our purposes, WestConn has adopted a demonstration portfolio model. Using Google Sites or other hosting services, the electronic portfolio has 8 categories (fields) and is structured as a demonstration portfolio. 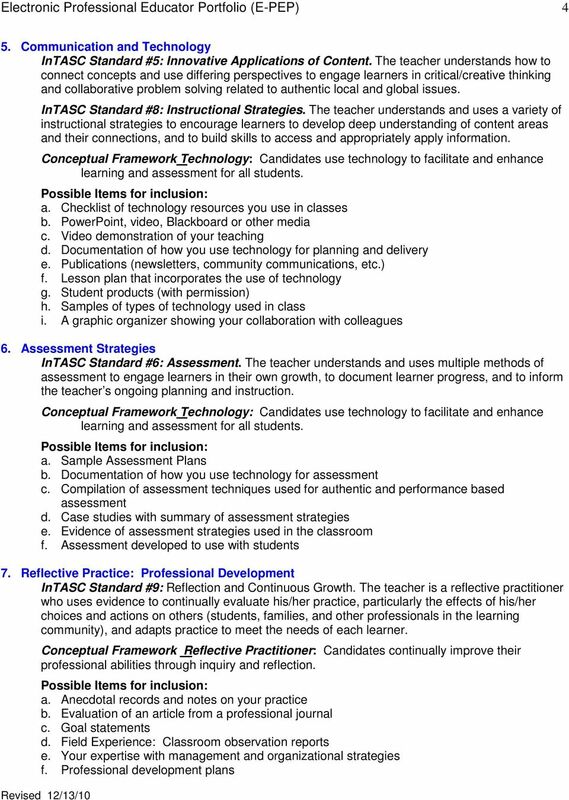 Our Professional Educator Portfolio is aligned with standards of the Interstate Teacher Assessment and Support Consortium (InTASC) and our unit Conceptual Framework. The Conceptual Framework is also closely aligned with state and national standards, and reflects the philosophy, mission and objectives of WestConn, the School of Professional Studies, and the E & EP Department. Following is a partial list of artifacts that might be included in the Electronic Professional Educator Portfolio (E- PEP). Items have been sorted using the Conceptual Framework as a model. The Conceptual Framework is embodied in the term EDUCATOR. 1 Adapted from the work of Drs. Leah Stambler and Ed Duncanson. 2 Prince Georges County Public Schools. Welcome to the Electronic Learning Communities. Retrieved from on September 9, Stambler, L. (2005). 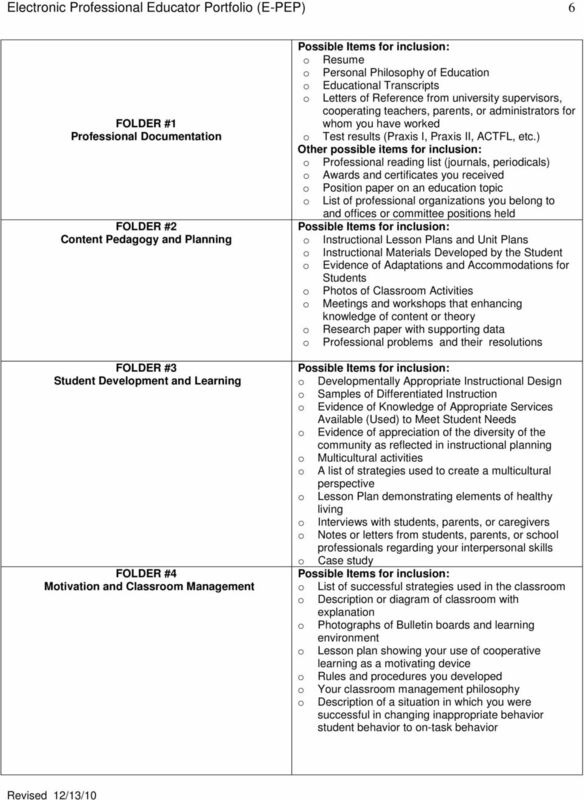 Requirements of the 4 categories for the contents of your collection professional educator portfolio. 2 Electronic Professional Educator Portfolio (E-PEP) 2 Title Page 4 (Home page on Google Sites) Table of Contents 1. Professional Documentation Conceptual Framework Expertise in Content Knowledge: Candidates for teacher or counselor certification must possess knowledge in order to facilitate student growth and achievement. InTASC Standard #9: Reflection and Continuous Growth. The teacher is a reflective practitioner who uses evidence to continually evaluate his/her practice, particularly the effects of his/her choices and actions on others (students, families, and other professionals in the learning community), and adapts practice to meet the needs of each learner. Items for inclusion: a. Resume b. Personal Philosophy of Education c. Educational Transcripts d. Letters of Reference from university supervisors, cooperating teachers, parents, or administrators for whom you have worked e. Test results (Praxis I, Praxis II, ACTFL, etc.) Other possible items for inclusion: f. Professional reading list (journals, periodicals) g. Awards and certificates you received h. Position paper on an education topic i. List of professional organizations you belong to and offices or committee positions held 2. 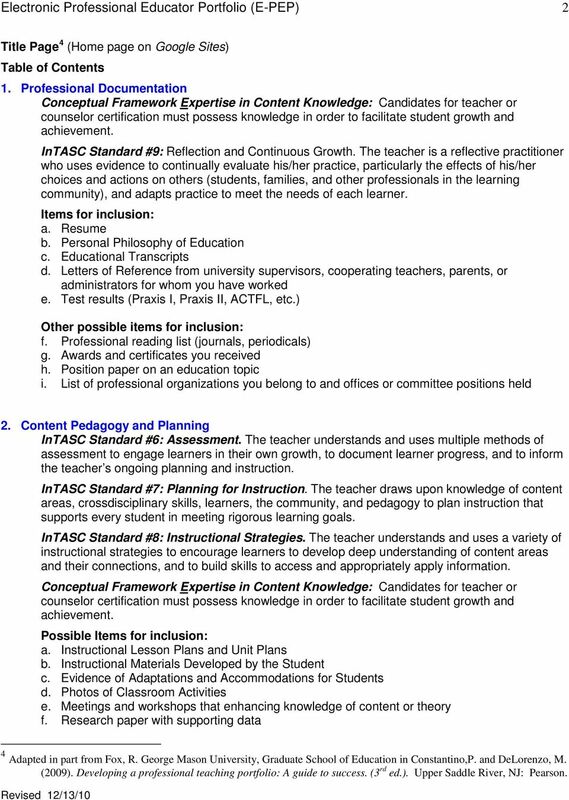 Content Pedagogy and Planning InTASC Standard #6: Assessment. The teacher understands and uses multiple methods of assessment to engage learners in their own growth, to document learner progress, and to inform the teacher s ongoing planning and instruction. InTASC Standard #7: Planning for Instruction. The teacher draws upon knowledge of content areas, crossdisciplinary skills, learners, the community, and pedagogy to plan instruction that supports every student in meeting rigorous learning goals. InTASC Standard #8: Instructional Strategies. The teacher understands and uses a variety of instructional strategies to encourage learners to develop deep understanding of content areas and their connections, and to build skills to access and appropriately apply information. Conceptual Framework Expertise in Content Knowledge: Candidates for teacher or counselor certification must possess knowledge in order to facilitate student growth and achievement. a. Instructional Lesson Plans and Unit Plans b. Instructional Materials Developed by the Student c. Evidence of Adaptations and Accommodations for Students d. Photos of Classroom Activities e. Meetings and workshops that enhancing knowledge of content or theory f. Research paper with supporting data 4 Adapted in part from Fox, R. George Mason University, Graduate School of Education in Constantino,P. and DeLorenzo, M. (2009). Developing a professional teaching portfolio: A guide to success. (3 rd ed.). Upper Saddle River, NJ: Pearson. 2. Pedagogy The beginning teacher displays competence in both the factual and theoretical bases of pedagogy. A. The master of arts, educational studies program will allow students to do the following.